Okay, at this point you’re probably pretty positive I’ve never played anything but demoman. But that isn’t true, actually he’s not even my main. I consider myself a Medic. How we medics see ourselves. 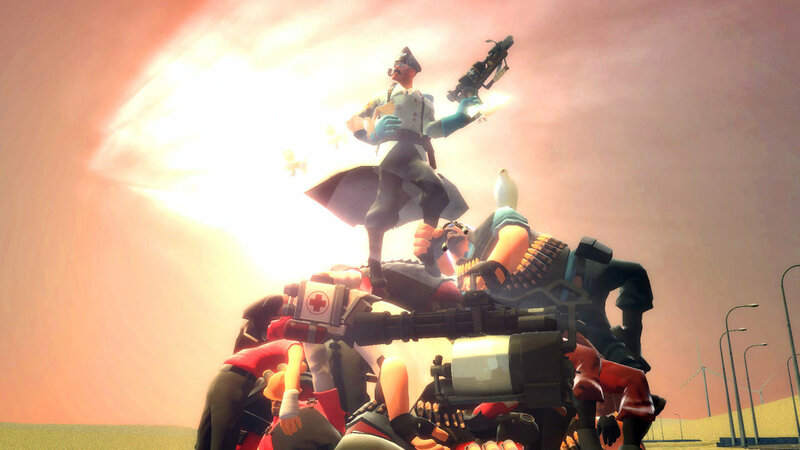 Most other classes probably see us as the RED medic underneath the minigun. Photo by agentslate. Problem is, I haven’t played him recently because I’m still recovering from my bitter break-up with the Amputator, my favorite bonesaw until July 10th. 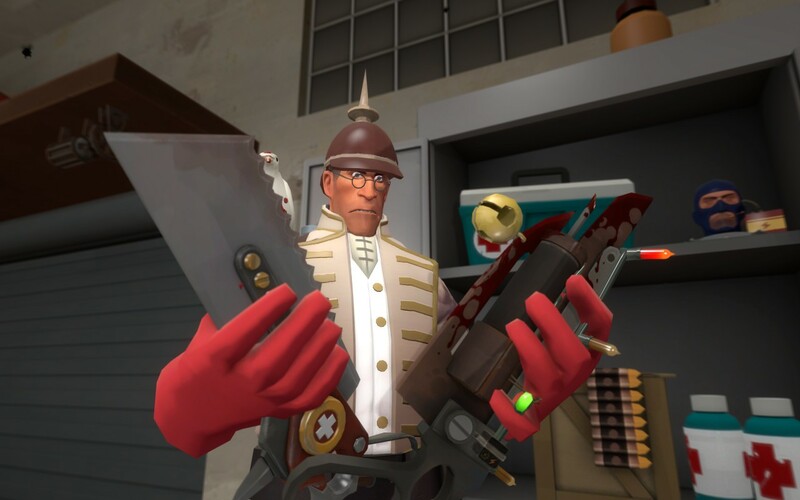 On that day, Valve removed all of the set bonuses from TF2, including the one from Medieval Medic, which gave +1 hp/sec regenerated for equipping the crossbow and Amputator. With this regen bonus gone, there is very little reason for me to equip it, a fact that the strange festive Ubersaw I unboxed last Christmas won’t stop muttering under its breath. It’s true. My bonesaws speak to me. Archimedes has repeatedly told me I should go see therapy. Photo by FeelGoodInc. So as much as I wanted to give up on TF2 forever, I instead tried out the Ubersaw, fearing that I would grow to love it. Do I love it? Well….it’s pretty awesome when it works out, I’ll admit. Killing somebody usually means at least 50% uber right there. But it also keeps encouraging me to do dangerous things, because suddenly the allure of fighting this sniper becomes much greater than “I could live to fight another day.” Now, being reckless might reward me with significant amounts of glorious Ubercharge, which far too often I seem to decide is worth it. I took this opportunity to also try the Syringe Gun over the Crossbow, but ultimately decided to stick with my long-range heals dispenser. Neither weapon is particularly good at self-defense, but with my 200 hours of crossbowing people I’ve gotten good enough at dissuading people from pursuing me. And landing a long-range +150 on somebody feels awesome, almost as awesome as Ubersawing someone to death and realizing that panicked flurry of self-defense gave you full Uber. Or successfully tauntkilling someone and getting full Uber for your trouble. Or entertaining myself with the blinky lights when I’m bored. Maybe I’m not giving that saw enough credit.